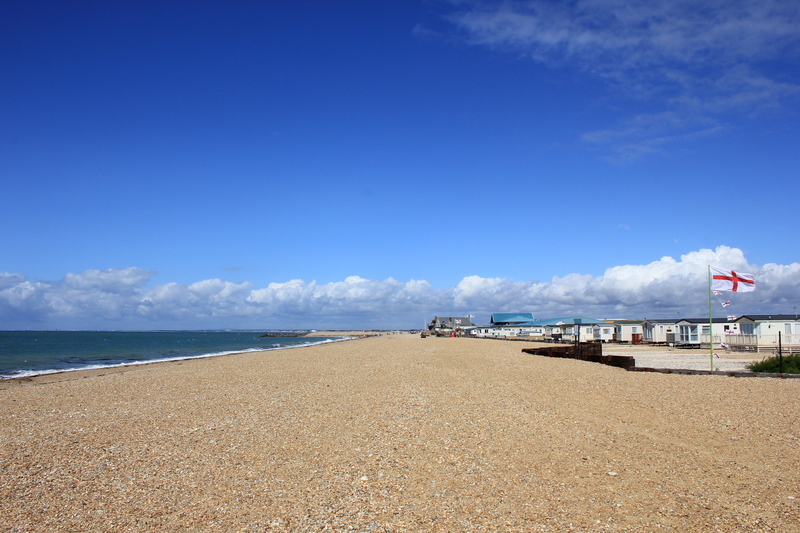 As we walked out of Selsey and reached its northwestern outskirts, the clouds cleared and were replaced with a glorious shade of deepest blue. How did that happen? Not half an hour ago we were sheltering from a blustery squall and wondering if we should stop walking and go home. 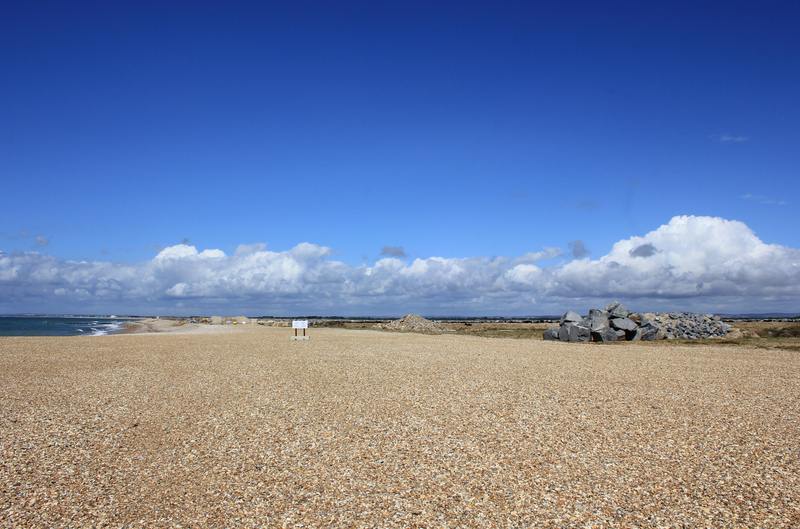 As we tramped along the shingle beach, it occurred to me that this shingle was not of the usual type. It did not seem quite as smooth and sea-worn, and there seemed to be builders’ sand in it, as if it had come from an aggregate yard. I also noticed some strangely placed rip rap. It was set back from the shoreline by a good hundred feet or so. What was the point of having this isolated pile of rip rap so far away from the waves it was supposed to be holding back? Had the shingle been transported in? Had the beach been reclaimed from the sea? That would explain why the breakwater was so far back. It would also explain why the shingle had that builders’ feel to it. As I was pondering this we came across a sign. 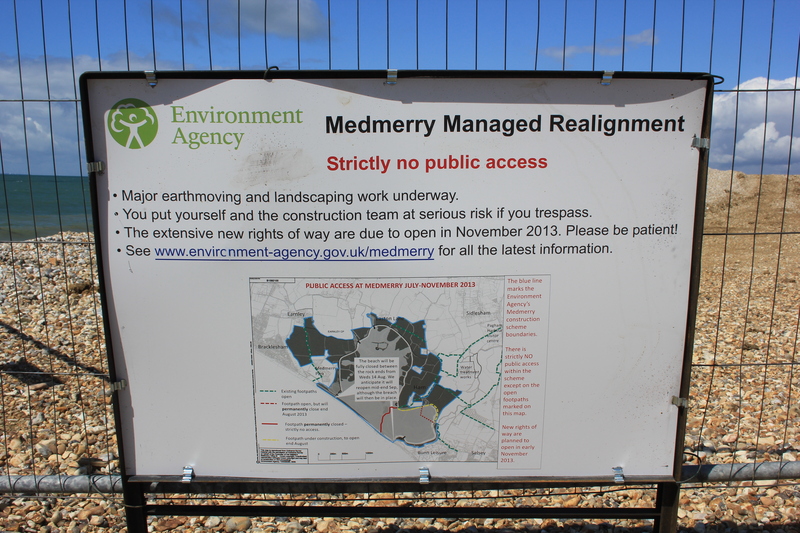 The Medmerry Managed Realignment Scheme turned out to be a massive flood defence programme. 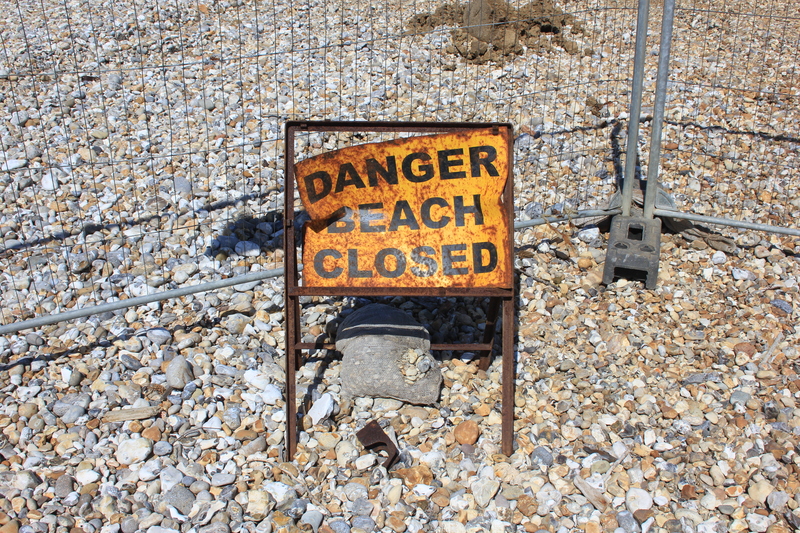 They were just starting; the beach had been closed only 96 hours earlier, and would remain closed for another three months. The reason the beach had been closed was because there was so much dangerous construction traffic moving around, of which we could see nothing. Not a digger, bulldozer or lorry rumbled around on the other side of the fencing. The beach stood empty and silent. Feeling rather frustrated that the beach had been closed only four days earlier, I consulted the map. The closed section of beach was approximately one and a half miles in length. The suggested detour, however, was a circuitous inland route of approximately 5 miles. The fencing that closed off the beach did not run right down to the sea. It stopped at the high tide mark. Did this mean the beach was open at low tide? Even if it didn’t, this seemed a reasonable excuse to carry on, and I was most definitely looking for any excuse to carry on. If we managed to get over half way into the Forbidden Zone before being caught then surely we could argue that it would be quicker and safer to walk on through and out the other side! Just as I was rehearsing these and other arguments, I caught a flash of neon yellow out of the corner of my eye. A construction worker! Deb and I debated our options. If we ran down to the lower beach, round the fencing and made a dash for it, then surely we would be seen. Furthermore, making a dash for it would be an overt display that we were fully aware that we were doing wrong. Any reasonable arguments we might have for being allowed to continue would fall on deaf ears. We could, of course, simply keep running, but would we be able to outrun a workman if he gave chase? How many more workman might be further along the beach, and did they have walkie-talkies? Would their superior communication infrastructure allow them to outflank us in a pincer movement? No, making a run for it would not do. There was no option but to approach the workman and appeal to his better nature. I told the others to wait where they were. I walked down the beach, round the fencing, and entered the Forbidden Zone. The workman saw me and stopped, looking at me. I waved in a friendly way and walked up the beach towards him. He did not shout at me to get back to the other side of the fencing – he was, at the very least, approachable. Could this be a good sign? I pleaded to his good nature. 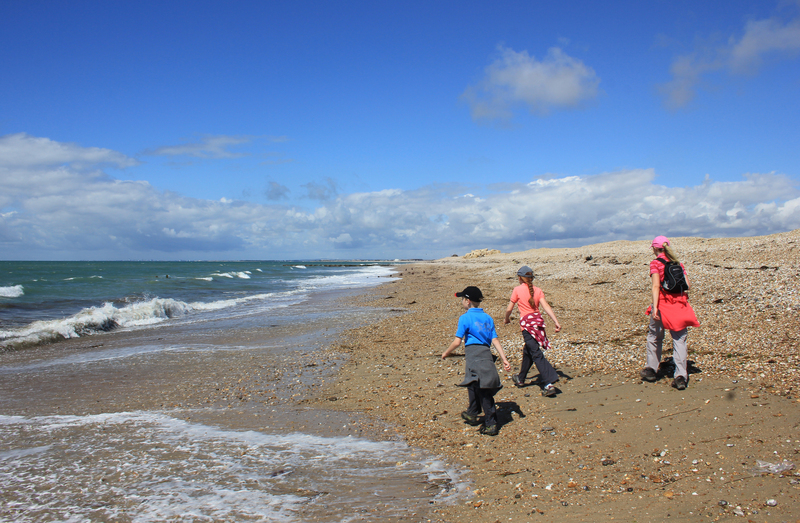 Our entire family, I said, including 10-year old twins, were almost 500 miles into a walk around the coast of Britain. It was such a shame not to walk this stretch, and there appeared to be no vehicles around this quiet Sunday morning. Did he think it might be possible to spare us the five-mile detour? He looked at me indifferently and shrugged. “I don’t care – I don’t work here!” he said in a bemused voice. “I just put this work vest on so I looked official. I’m having a nosey around. Anyway, if you read the law you’ll see that only the coastguard or the Queen herself can throw you off the land”. I looked around suspiciously. There was no sign of the Queen patrolling around in a hi-viz. I beckoned the others over and we set off at a fast pace, waving our thanks to the man and keeping a keen eye out for neon vests and/or the sparkle of crown jewels in the distance. It was just us and the gulls. We encountered nobody else. As we passed the half way point into the Forbidden Zone we relaxed a bit – we were on the home straight now. 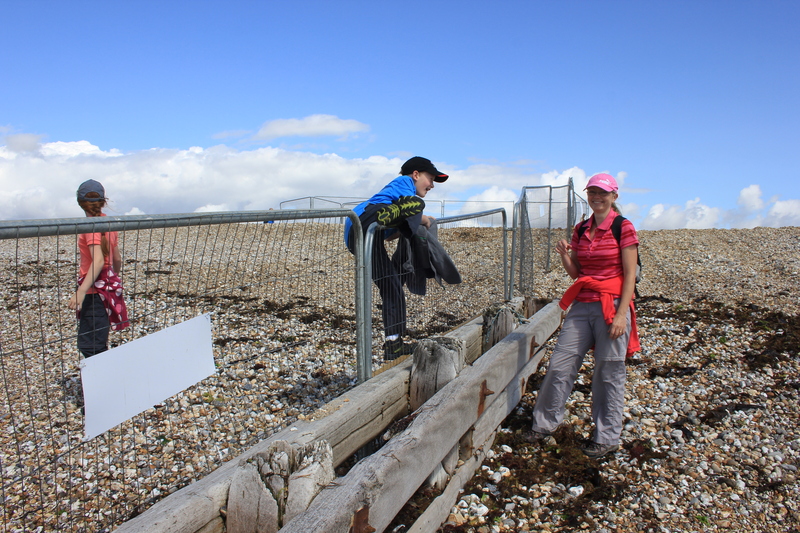 At the other end of the closed section of beach, however, we were presented with a problem. 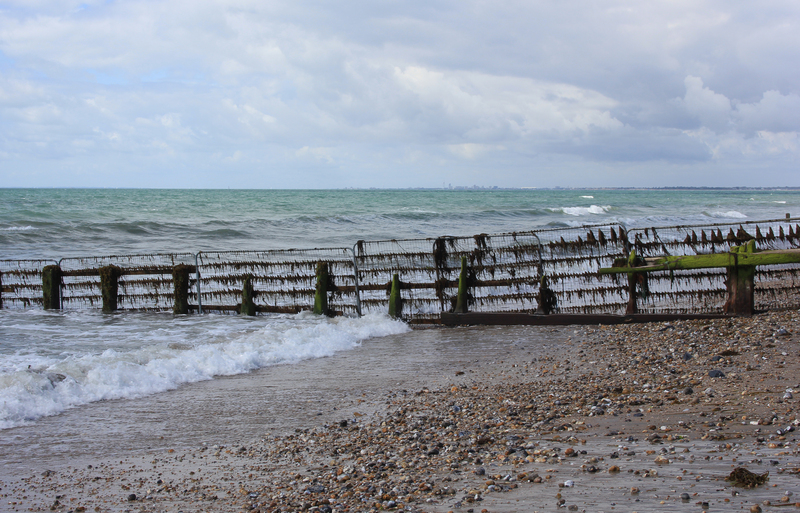 Here the fencing had been lashed to a groyne and run right down into the watery depths. There was only one thing for it! Under the quizzical eyes of the people on the opposite side of the fencing, we began to climb. Safely on the other side, we breathed a collective sigh of relief for a second. Then, with 6,500 miles ahead of us still to finish, we walked on west. This entry was posted in West Sussex and tagged beach, bracklesham, closure, coast, medmerry, selsey, travel, trespass, walking, west sussex. Bookmark the permalink. Brilliant! I love this account of your adventure. A great story. It reminded me so much of all the “incidents” that happened to me when I was doing fieldwork as a biologist. Thank you! It was a minor event in the overall scheme of things, but I cannot tell you how pleased we were to have avoided the 5-mile detour! The environmental work and those fences were not there when I walked that section, thank goodness. I would probably have done the same as you and scurried across the Forbidden Zone – but I might have burst into tears when I found the fence at the other end! Love the story of the man in the yellow vest. Isn’t it funny how we defer to anybody wearing one? My husband has one – mainly for cycling – but it can be used as a free ‘Access all Areas’ pass. Yes! I have one for work. I am also a keen geocacher and when I am trying to find a geocache in a public place a hi-viz and a clipboard doesn’t half allow you to act strangely without arousing suspicion! It’s walks like this that give you the best stories afterwards Lol! The same stretch of beach was fenced off when I walked it in early 2011 and for much the same reason. Unfortunately, it was also covered in big yellow diggers, moving about at speed so I had to detour inland, getting lost-ish on some tiny farm tracks that I may or may not have supposed to have been on. Clearly I need to buy a high-vis vest! Ju – not only are hi-viz vests as cheap as chips; they also fold up into a next-to-nothing size. They are truly worth their non-existent weight in neon-gold.